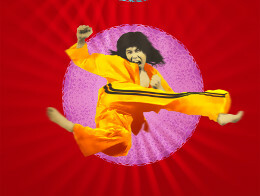 The Bard meets Bruce Lee in this high-octane new production inspired by the world of classic 1970s Kung Fu cinema. Two pairs of twins, separated at birth, unwittingly find themselves in the same city, unleashing a series of uproarious misunderstandings, in this most farcical and youthful of Shakespeare�s comedies. A young creative team, lead by award-winning director-designer duo Matthew Wild and Angela Nemov, will conjure up a bustling, magical Chinatown on the stage of Cape Town�s favorite open-air theatre. Led by Rob van Vuuren, James Cairns and a stellar cast promises to bring this lovable play to hilarious life. The Comedy of Errors is presented by Artscape, in conjuction with the National Lottery Distribution Trust Fund. Performances are from 10 January to 18 February 2012 with previews on 10, 11, 12 & 13 January at 20:15 and tickets are R100, R130, R150. Family nights 16 & 17 January at 19:15. 2-tickets-for-the-price-of-1.